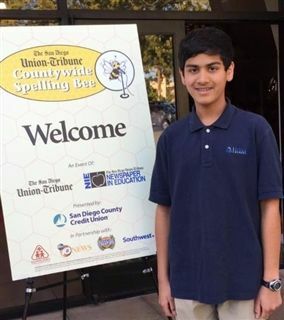 On Tuesday, March 16th, 8th-grade student Shivam Desai participated in the San Diego Union Tribune Countywide Spelling Bee. He was one of 102 students to take the stage at Balboa Park's San Diego Hall of Champions for the 47th annual event. Shivam nailed his first round word, "acme," before being eliminated in the second round for failing to correctly spell "realschule," a German word for a type of secondary school. Congratulations to Shivam on representing Pacific Ridge with such poise.